SWBAT use an open number line to manipulate time, in 30-minute intervals, and to measure elapsed time of ten-minute intervals. Open number lines are a versatile and simple mental model for measuring elapsed time. This lesson develops students' analog knowledge using the skills they are close to mastering. Students are given a number line time warm up, with carefully crafted problems that serve the dual purpose of getting them thinking about what 30 minutes represents while also providing me with diagnostic information about remediation needs. We are practicing a 2nd grade standard (2.MD.7). Before I move them back up to "crossing the 12," I need to insure that the fundamental skill set for reading and recording analog time is in place. I record data on how the students approached this warm-up, both while they are working on it and when I review it after school. After I collect papers, I make a short list of some of the students' ideas about activities that take approximately 30 minutes, without making any comments other than those needed for clarification. Later, they will be able to reflect on their original analysis of each time interval to determine if it has changed. Then, for fun, we play briefly with the idea of 30 SECONDS. I pick a handful of children to be "watchers". The rest close their eyes when I say, "go," and raise their hand when they think 30 seconds have passed. I stop timing them anywhere between 45 seconds and 1:10 minutes so that the end time isn't a confounding factor. I repeat this a few times. I introduce students to an open number line. If your students have already worked with open number lines, you can skip this section. Adding adding 5 hours to 2 pm and 5 hours to 9 pm. If an activity starts 9 a.m. and ends at 1 p.m., how long was the activity? How about if the activity starts at 6 p.m. and ends at 11 p.m.? 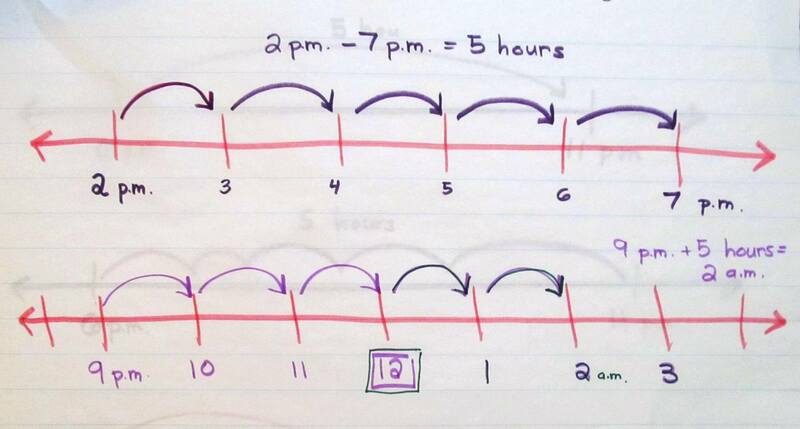 Using a number line to compute elapsed time is a helpful tool, but may not be the best introduction to open number lines because, technically, it represents an iterative 12-hour cycle. Also, although a number line is an excellent model to demonstrate mathematical thinking as well as an effective strategy, if students are not accustomed to using them I recommend that you practice several times to ensure that students know how to use them. You'll be glad you did because you can continue to use open number lines when introducing multiplication and they are particularly useful in teaching fractions. 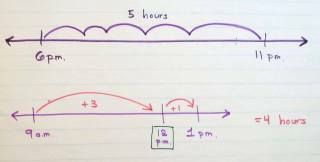 Open Number Line Example: if an activity starts 9 a.m. and ends at 1 p.m.
Now we are ready to begin using an open "time" number line as a tool when reasoning with time. I give students the following problems and quickly go over each one. The primary goal here is to make sure students understand how to use not only an open number line, but one that is special to the context of time. It also is a reteach for those who are still developing their concept of elapsed time, to the hour, and crossing 12 noon and 12 midnight. 9 p.m., 11 p.m., 5 a.m.
5 p.m., 10 p.m., 12 p.m.
11 p.m., 3 p.m. 6 p.m. If an activity starts at _____ and ends at _______, how long was the activity? We work through the following examples together. Students write their answers on individual whiteboards or scrap paper. It is critical to continue to closely monitor student responses. I ask students to (silently) think about how they would teach this to a child who hasn't yet worked with open number lines and time. Then I have them explain their strategies to a partner.